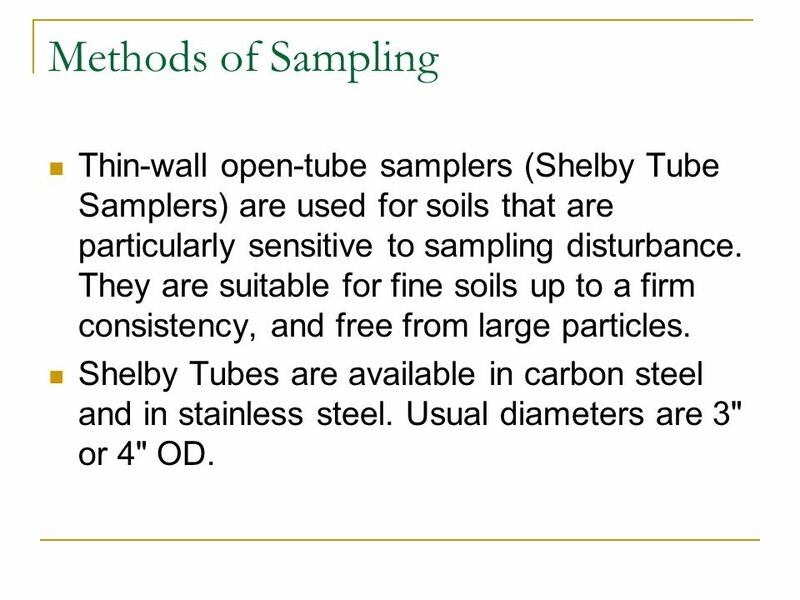 6 Methods of Sampling Thin-wall open-tube samplers (Shelby Tube Samplers) are used for soils that are particularly sensitive to sampling disturbance. They are suitable for fine soils up to a firm consistency, and free from large particles. 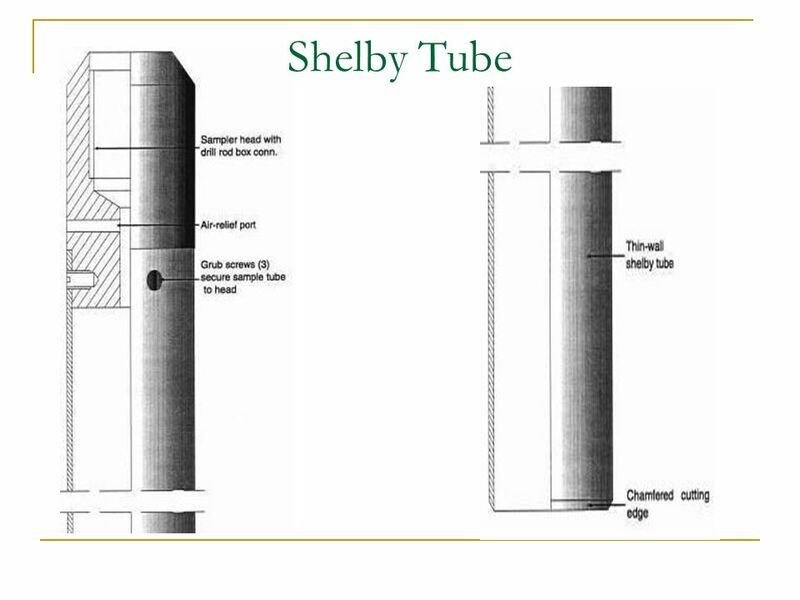 Shelby Tubes are available in carbon steel and in stainless steel. Usual diameters are 3" or 4" OD. 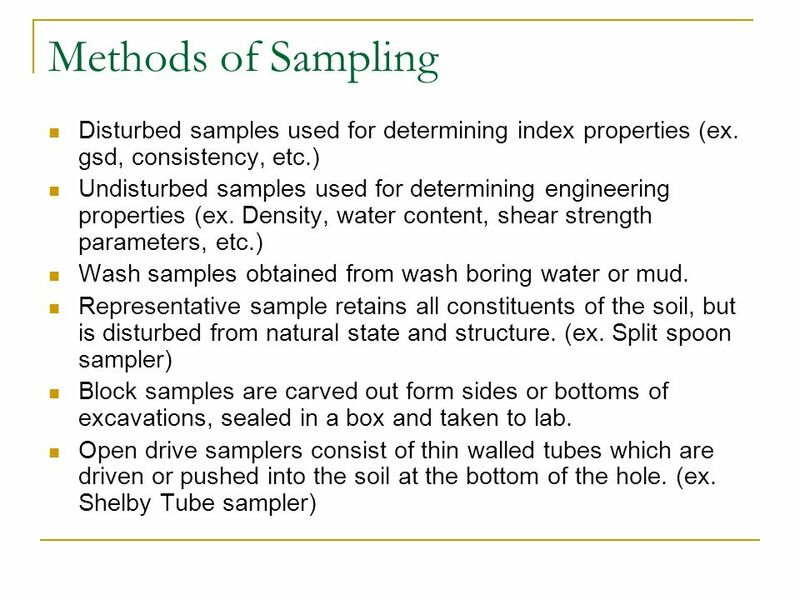 10 Methods of Sampling Requirements to minimize disturbance to samples . 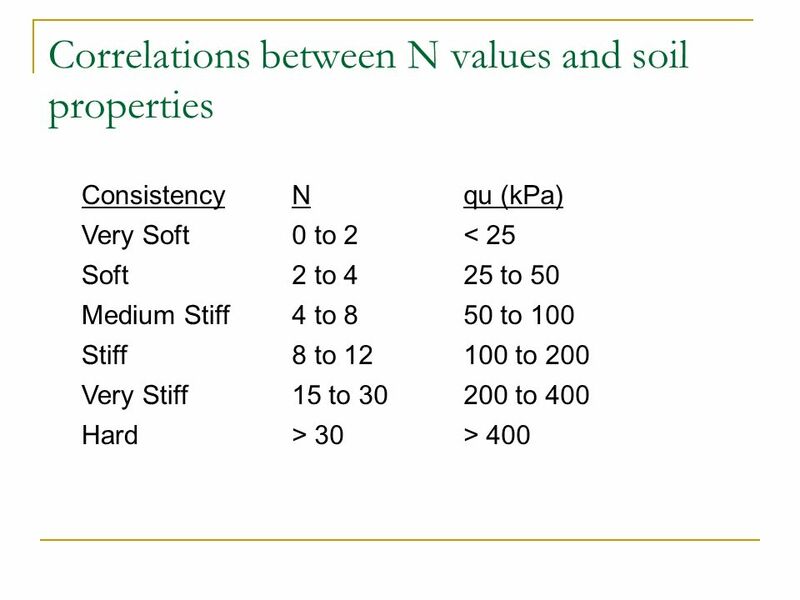 Area ratio = (D2w-D2e) x 100% D2e Area ratio should be as low as possible. (<10%). It represents the amount of soil displaced. Inside clearance = (Ds-De) x 100% ratio De . 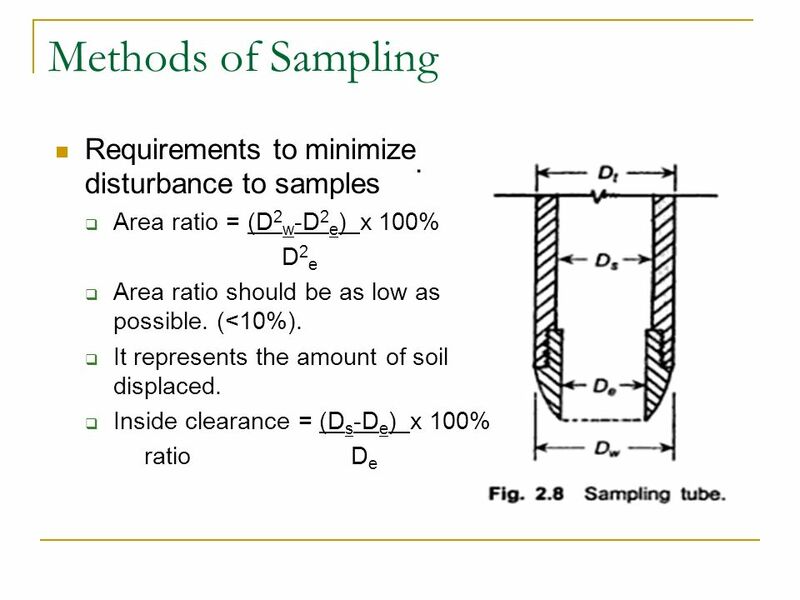 11 Methods of Sampling The inside clearance allows elastic expansion of the sample and minimizes frictional drag on the sample. 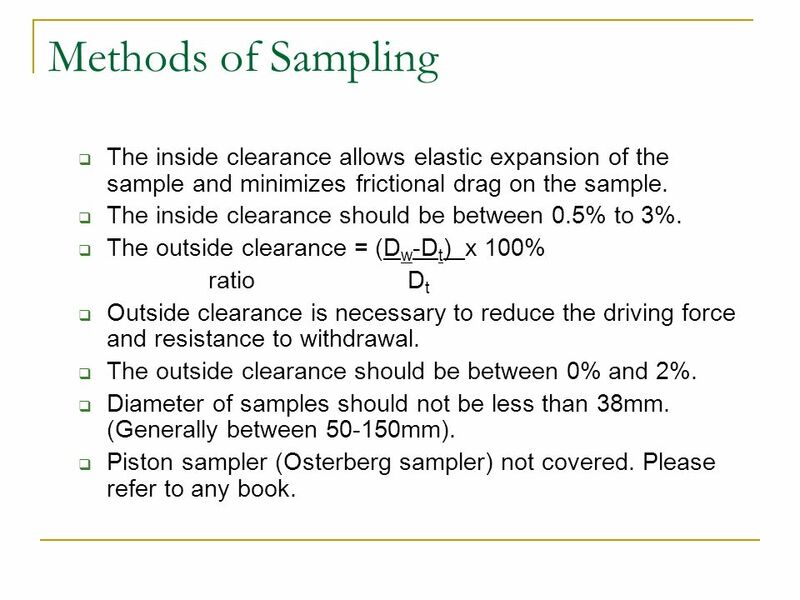 The inside clearance should be between 0.5% to 3%. The outside clearance = (Dw-Dt) x 100% ratio Dt Outside clearance is necessary to reduce the driving force and resistance to withdrawal. The outside clearance should be between 0% and 2%. 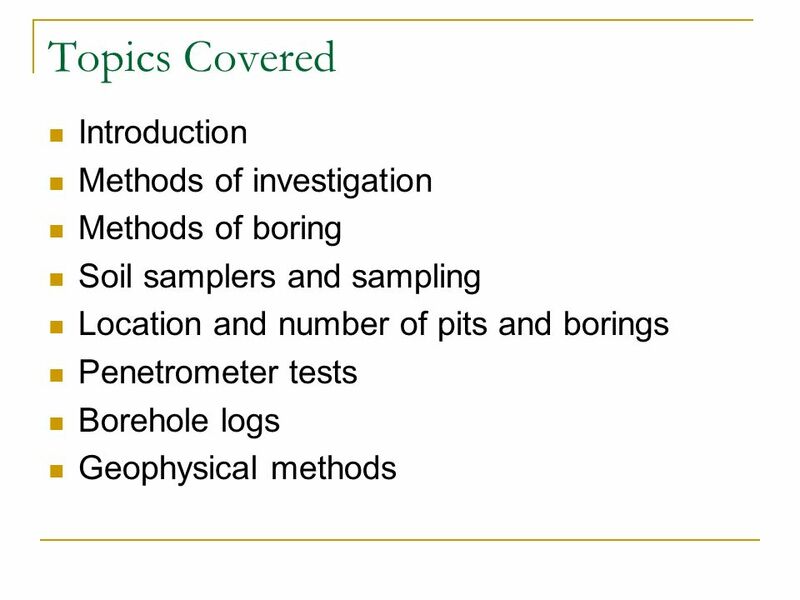 Diameter of samples should not be less than 38mm. (Generally between mm). Piston sampler (Osterberg sampler) not covered. Please refer to any book. 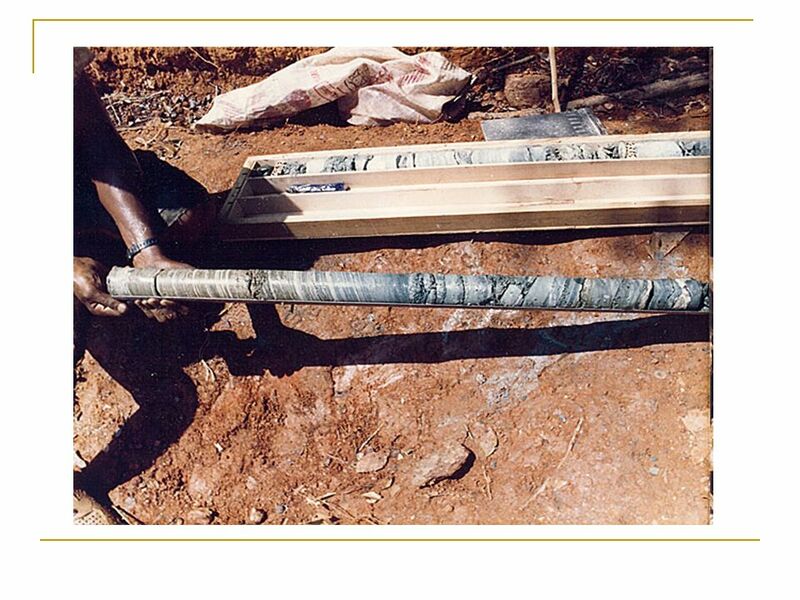 12 Rock coring Sampler consists of core barrel and bit is coring bit. 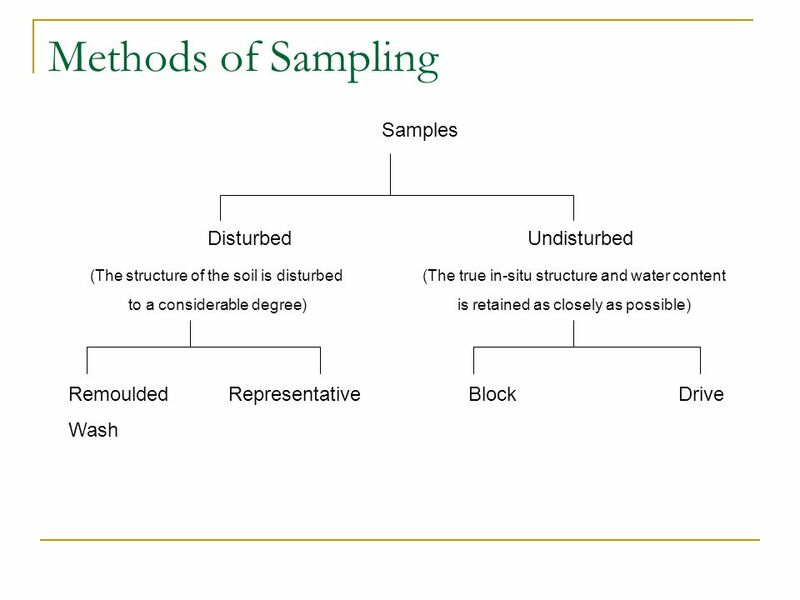 IS:2131 – 1981 Method for Standard Penetration Test for Soils. 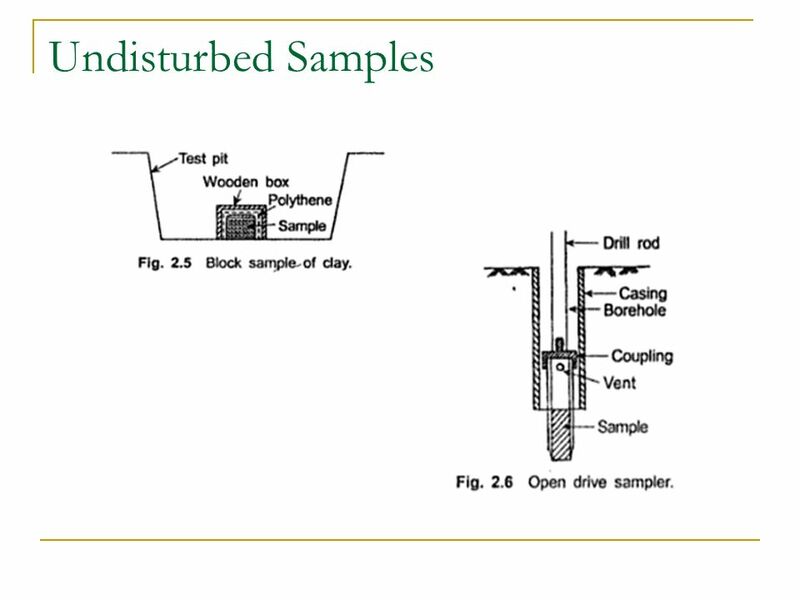 Most important and most commonly used field test Typical equipment: drill rig, split spoon sampler, hammering equipment, casing pipe. 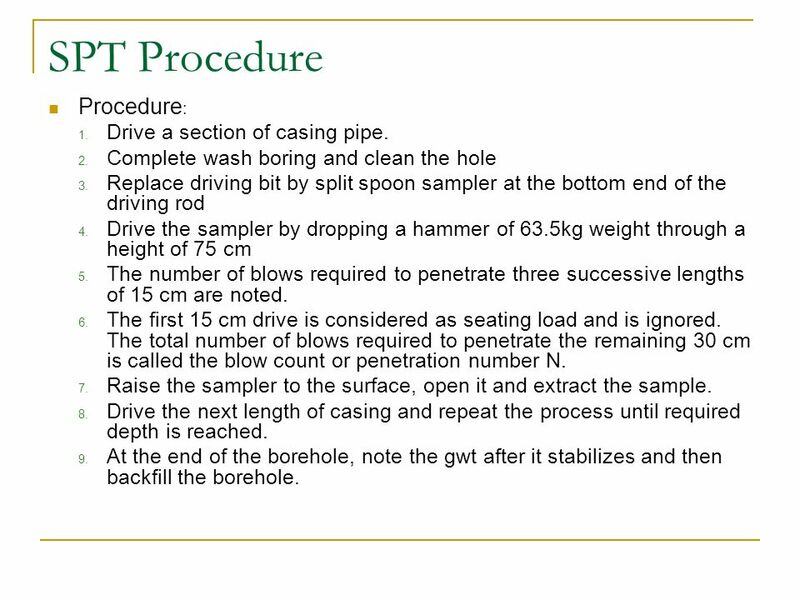 15 SPT Procedure Procedure: Drive a section of casing pipe. 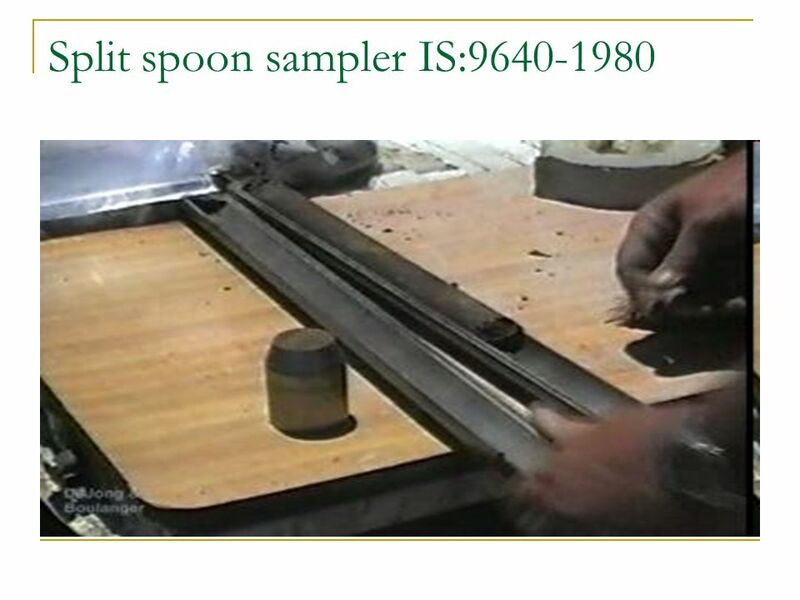 Complete wash boring and clean the hole Replace driving bit by split spoon sampler at the bottom end of the driving rod Drive the sampler by dropping a hammer of 63.5kg weight through a height of 75 cm The number of blows required to penetrate three successive lengths of 15 cm are noted. The first 15 cm drive is considered as seating load and is ignored. 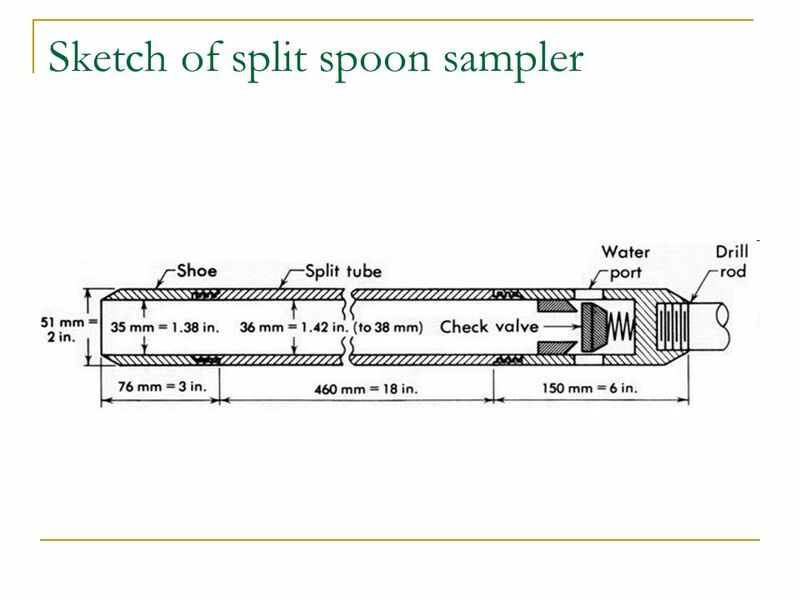 The total number of blows required to penetrate the remaining 30 cm is called the blow count or penetration number N. Raise the sampler to the surface, open it and extract the sample. Drive the next length of casing and repeat the process until required depth is reached. At the end of the borehole, note the gwt after it stabilizes and then backfill the borehole. 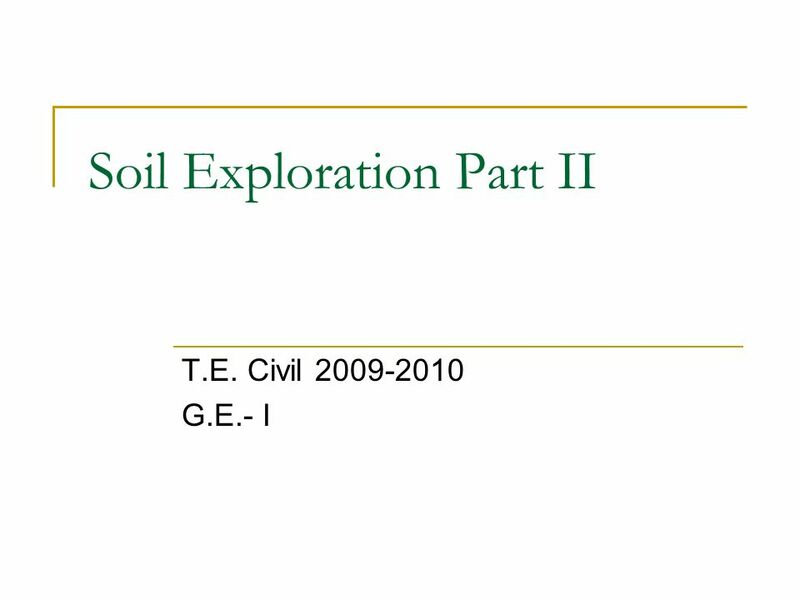 Download ppt "Soil Exploration Part II"
Soil Exploration T.E. 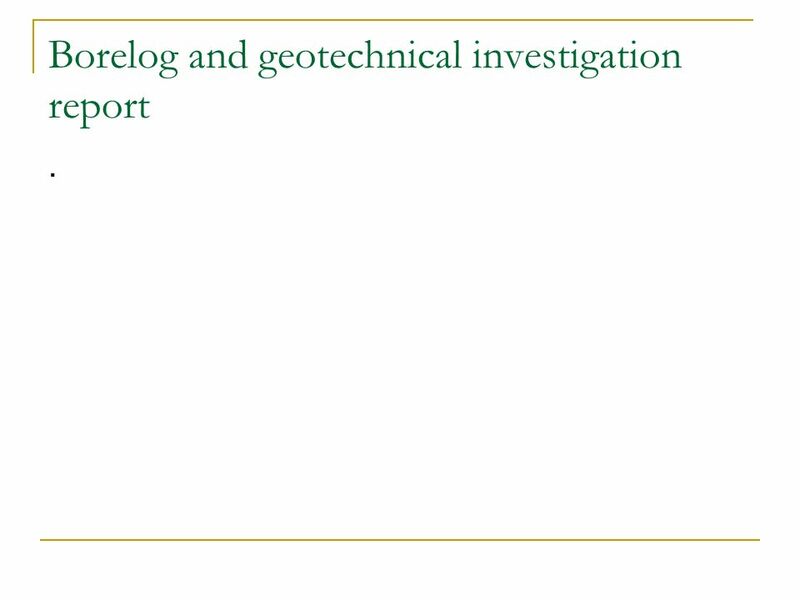 Civil G.E.- I. 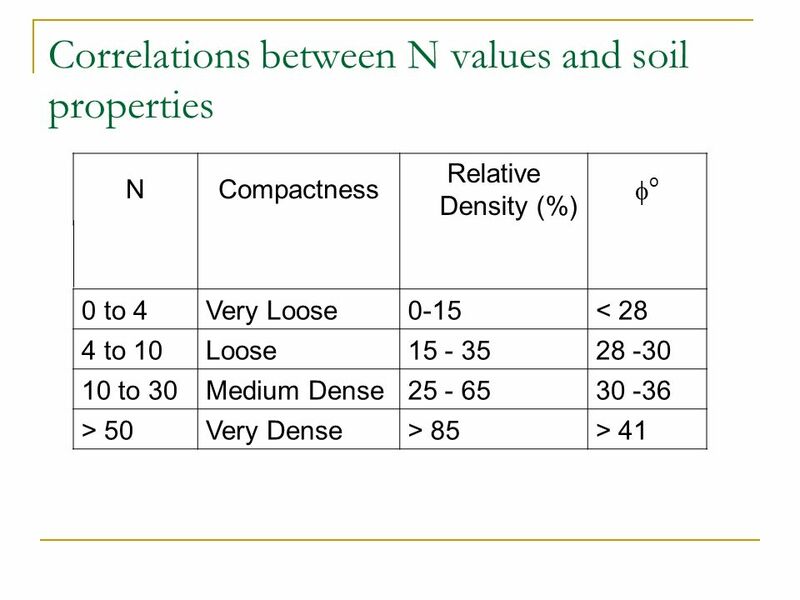 Soil Mechanics - II Practical Portion. 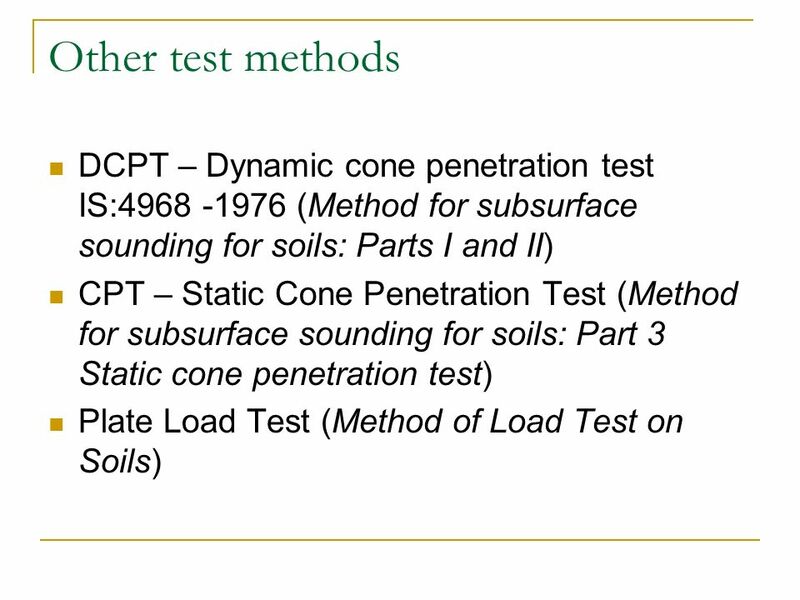 The standard penetration test (SPT) is an in-situ dynamic penetration test designed to provide information on the geotechnical. Environmental Drilling By: Josh Humphreys October 8,2006. Wave Equation Applications 2011 PDCA Professor Pile Institute Patrick Hannigan GRL Engineers, Inc.